BOSTON - Walpole tried face-guarding both star Hansen sisters, and even got a fantastic performance from senior goalie Morgan Fontana (10 saves), but it wasn't enough to even slow down Cohasset, as the Skippers rolled 14-6 at Boston University's Nickerson Field, capturing the Division 2 state championship. 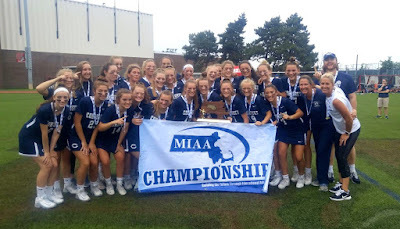 Cohasset (21-2) was relentless from the opening draw, putting constant pressure on the Walpole (22-2) back line, thanks to the transition brilliance of juniors Jane and Elle Hansen, and big games from Julia Placek (3G, 1A), Marina Longo (2G, 2A) and Molly Greer (1G, 2A). "Best feeling in the world, we wanted it so bad," Elle Hansen said. "We just worked so hard to get here, and it's just unbelievable. I can't even describe it, it's just so amazing." "We've worked so hard all season," Jane Hansen added. "It really paid off and got us the win." Jane Hansen paced the Skippers with five goals and an assist, including Cohasset's first goal of the day after they fell in a 1-0 hole, thanks to a score by Walpole's Melanie Weber (2G). Jane Hansen then dished out a nifty assist to Placek to give the Skippers a lead they would never relinquish, before her sister Elle Hansen (2G, 1A) got on the board midway through the first half. After a score by Walpole's Alison Foley (2G), Cohasset went on a 5-0 run to end the first half, thanks to goals by Olivia Coveney (1G), Elle Hansen, Greer and Jane Hansen before intermission. Walpole came out firing to start the second half, with Foley scoring her second goal off a feed from Sydney Scales. Skipper coach Kully Reardon, who knew that Walpole had mounted a furious comeback in the D2 final against Norwell on this same field last year, quickly called time to chat with her team. "I had to blow a second timeout to tell (the Skippers) that's not acceptable," Reardon said of her team giving up a quick goal. "(Walpole) has done this before. They're gritty, they're a tough, they're a hard-working team, and their coaches get them so fired up, that I saw a comeback coming." Now re-focused, Cohasset went on its second five-goal run of the morning. Jane Hansen and Longo each scored two over the stretch, to go with Placek's second of the day. By the time Weber interrupted the run to make it 12-4 Cohasset, it was already too late. Jane Hansen scored her fifth moments later, though Walpole kept fighting, with two late Emily Curtis (2G) goals giving the Rebels their six goals on the day. Placek finished the morning's scoring with a goal in the game's final minute, completing her hat trick. "We just wanted to push (the pace)," Elle Hansen said. "That was our strength throughout the whole season, pushing it as fast as we can down into the offensive zone. So that's just what we worked on, and it was very effective throughout the season."